Sleeps 14-16: 6 Bedrooms 6 Bedrooms (4 queen beds, 1 King in Master and 2 bunk bed sets "off master") , 3 Baths, Roku w/Sling/Netflix, Firepit in the Back, BBQ Grill, Pool Table and a Hot Tub right outside, also a creek is down the hill. Our spacious Pocono Vacation Rental has 6 bedrooms and 3 bathrooms! Each bedroom in our spacious house includes a queen size bed. There are also three pull-out couches in the living room. 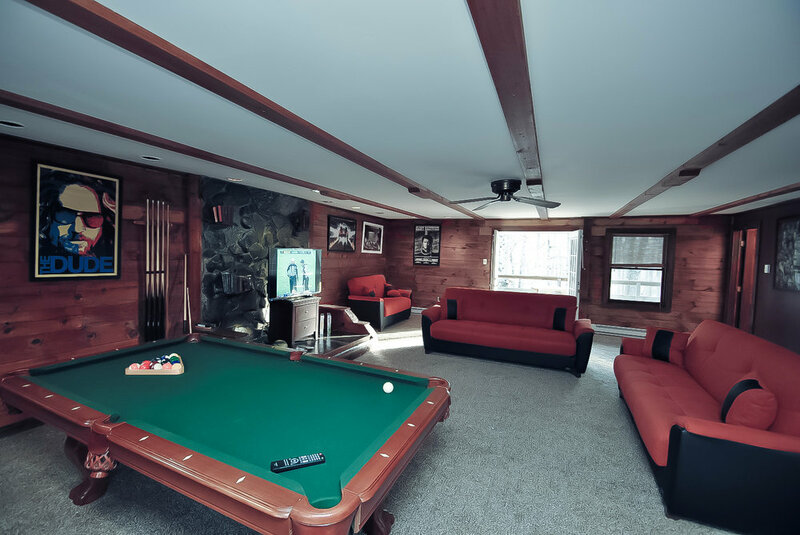 Pocono Home & Cabin Rentals - Houses, Cabins, Lodges, Rentals with Hot Tubs/Jacuzzi, Pool Tables, Indoor and Outdoor Pools, Close to Skiing, Hiking, Swimming in Pocono Mountains. Romantic & Family Style Rentals. 5 Star Hosts. Close to Camelback & Shawnee Mountains. Near Kalahari, Great Wolf Resorts. 24/7 Customer Service. This Grand Summit Lodge on Whiskey Mountain has 7 Sleeping Areas - 11 Beds and Sleeps 21 with a Hot Tub. It is currently one of our largest Pocono vacation home rentals. Nearest attractions include Camelback Resort, Shawnee Mountain, Jack Frost, Mount Airy Casino, Delaware Water Gap and The Crossings Premium Outlets. While our kitchen comes fully stocked with all your cooking needs, make sure you stop by some of the best Pocono eateries - handpicked by our Pocono travelers. Our Pocono Vacation Rentals are made with you and your large family in mind. Features 6 bedrooms, 3 bathrooms (1 on first level & 2 on second level) with a Hot Tub. Game room equipped with brand new pool table, poker table & a variety of board games. Game Room also has 3 convertible beds and a private bathroom. Living/Family room equipped with a huge brand new sectional, and a Flat Screen LCD TV (with Netflix, Playstation3/DVD Player, and Wifi) sitting on a beautiful mantle. Kitchen with stainless steel brand new refrigerator, dishwasher, microwave and all serving and silverware, with a beautiful dinette set and 4 chairs. Dining room will allow for all your gourmet needs with a 8 person table, chairs and bench. The home is fully stocked with all kitchen & dinning needs. All bedrooms come with brand-new platform queen size beds, and standing mirrors (all linens included, as well as towels), which were custom designed to reflect a different style in each room. Last but not least, the top floor comes with a huge private master suite which includes a KING bed, private Flat Screen TV, separate stand up tiled shower and his & hers double vanity sinks. Brand new stainless steel gas grill with utensils, with table and chairs for all your BBQ needs.